All FIFA 11 guides, tutorials, videos, news, etc. In the FIFA 11 Lounge Mode, you can add up to four players from your own console only and play matches against each other. You can keep a running tally of things such as the games won/lost, goals scored/conceded, streaks, bookings, etc. This is a fun way to have a long lasting series of games to see who is the better FIFA player. 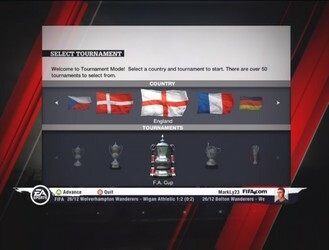 The tournament mode of FIFA 11 allows you to create tournaments to play with your friends or the computer. All of the teams, excluding the one you picked, will be filled by the computer. The tournaments are based off of real tournaments and cups. The tournament types are as follows: League, Knockout and Group & Knockout. 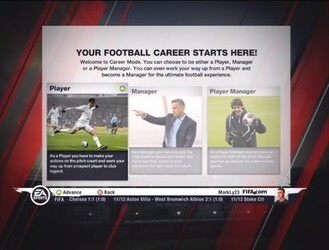 The Player Manager segment of Career Mode incorporates aspects of both the Player and Manager modes of Career Mode. In Player Manager, you manage the team as you would the manager of a team, but instead of controlling the entire team during matches, you control your one selected player/manager, who can be your Virtual Pro. Like the other segments of Career Mode, you will receive most of your notifications via email. The Manager segment of Career Mode incorporates aspects of the traditional Manager Mode of earlier FIFA versions. In Manager Career Mode, you manage the team as you would the manager of a team and control the entire team during matches. Like the other segments of Career Mode, you will receive most of your notifications via email. In the Player Career Mode, you play the role of a professional player climbing up the ranks of the footballing ladder. Although this segment of Career Mode can be compared to Be a Pro: Seasons from FIFA 10, it is significantly different. It is more basic in that you play with either your Virtual Pro or an already established player on a professional team. Penalty Kicks provide a scoring chance with a very high rate of success. Of course, it is possible that the keeper will guess the right way and save your shot, but the chance that you will beat the keeper is much higher. The FIFA 11 version of the series features an entirely new penalty kick system in which aiming is more precise and less computer-assisted. This tutorial will go more in depth on aiming and other techniques below. In FIFA 11, Free Kicks are rather easy to score, at least in comparison to previous versions. There is a wide variety of ways you can score a free kick, and this tutorial will go over the most useful, but also alternative free kick methods if you want to get a bit creative. The only types of free kicks you will really need are the Dipping Free Kick, the Driven - Dipping Free Kick, the Driven - Curled Free Kick, the Curled Free Kick, and the 2nd Man Free Kick. I will go over these in more detail within this tutorial.